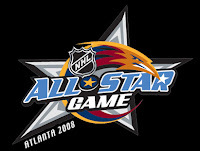 On January 27th, 2008, the NHL held the 56th Annual All Star Game (and Skills Competition). As a big hockey fan, I can't help but be bombarded with NHL All Star news and coverage each year. But year after year, I become less and less interested. At this point, I had stopped watching the All Star game, and pretty much just watch the All Star Skills Competition, and this year, even that didn't seem interesting enough for me to tune in. I did however happen to be flipping channels during the last 20 minutes of the Skills Competition, and I happened to catch the new breakaway format they adopted this season. Instead of just a shootout contest, they added a new twist, by having a panel of 4 judges who saw and watched each players attempted goal, and then gave them a score of 1 - 10, giving points for scoring, as well as flash. Players were trying all sorts of wacky stuff including spinning with the puck, dropping to their knees and sliding in on goal, and flipping the puck up in the air and trying to bat it out of the air like a baseball. It all make for a fun and exciting event. After catching just the end of this event, I really wanted to see the complete 2 hour Skills Competition, and after checking my online TV guide I found that it was not being repeated... drat! Luckily, both the All Star Game and Skills Competition both showed up on iTunes recently, so I promptly purchased the Skills Comp and sat in front of my computer watching it from beginning to end. Great stuff! That said, I still didn't watch the All Star Game. We came up with 56 solutions to fix the NHL’s marquee-game-that-really-doesn’t-mean-at-all. And since the NHL All-Star Game (the 56th edition of which is in Atlanta on Jan.27) is meant as a fun weekend for the fans, players and sponsors - oh, the sponsors - alike, we tried to inject a little playfulness into the proceedings. Some suggestions are serious - like, let’s kill the conference versus conference format for ... any other format - while some are brainchilds that might have you thinking we played the game without a helmet for too many years. No matter. The hope is the NHL will embrace the event as a chance to showcase not only its great players, but its great personalities as well. And if we can improve the actual on-ice product in the meantime, well, it’s about time. 1. Change the format. How about introducing Age Rage, with the enthusiastic under-30 guys going up against the crotchety over-30 crowd. 3. Or, the left-handed shot all-stars versus the right-handed shot all-stars. 4. Or, the visor-wearing all-stars versus the all-stars who, for some reason, doesn’t wear visors. 5. Or, the offensive all-stars versus the defensive specialist all-stars. 6. Or … well, you get the point. Change. The. Format. 7. Mic up every player and broadcast the best clips during breaks in the action. To take it a step further, have stretches – while the game is being played – where the only audio is on-ice chatter. 8. Have all the players stay in the same hotel. On the same floor. With a 24-hour reality TV crew on hand. 9. Have AC/DC and Nickelback perform. They’re the only two bands that hockey players listen to. Might as well give them what they want. 10. Instead of a 60-minute game, hold mini-tournaments in which players are grouped based on their junior teams. Oshawa vs. Kladno, Kamloops vs. Boston College, Red Army vs. Modo, etc. 11. More commercials featuring players as fun individuals (remember the NHL’s prank ad last year – “Ovechkin!”) instead of boring automatons. 12. Invite top junior and college players to the skills competition (John Tavares vs. Marty Turco in a shootout drill, followed by Alex Ovechkin vs. Simeon Varlamov). 13. New kills competition: Bodychecking. Imagine Dion Phaneuf vs. Shea Weber in the final, skating full force into a tackling dummy – whoever makes it fly the furthest, wins. Seriously … fans would go nuts. 14. Shootout contest with judges (Denis Savard, Wayne Gretzky, Mike Myers) and mediocre-goalies-turned-VIPs in net (Darren Pang, Garth Snow, Glenn Healy). 15. Fix the ballot nomination process (there was no Patrick Kane or Sergei Gonchar on the ticket this season, despite the fact the list was finalized in early November). 16. Give the players real incentive to win: the MVP gets a car and is exempt from all media requests. 17. Make the skills competition more like the old Showdown in the 1970s – player vs. player instead of conference vs. conference. Crown an overall winner and give him a car, too. 18. A shootout championship, featuring the regular season leaders in shootout goals vs. the goalies who have the best shootout stats. 21. Play 4-on-4 – if not for the entire game, at least the last five minutes of each period. 22. Assign each period a point value. For example, winning the first period is worth one point, the second two points and the third three points. That keeps the game interesting should the score be lopsided entering the third. 23. As a nod to defense – the grossly under-appreciated all-star trait that is grossly over-appreciated in regular season games – award bonus points for blocked shots and takeaways/intercepted passes. Accumulated a pre-determined total and you get a penalty shot as a reward. 24. Go back to the old-style meshing on the nets so the twine actually budges when a goal is scored. 25. Have a celebrity or hockey legend do the PA announcing on goal calls. 26. Dispense with the conference jerseys and go with throwback sweaters. The home team wears a throwback from the host city – this year, you could bring back the old Atlanta Flames look – while the visitors’ shirt is chosen online by the fans. (Our first vote would be for the California Golden Seals). 28. Play the game on international ice. Give those all-stars room to move. 29. The winning conference gets home-ice advantage in the Stanley Cup final. 30. Copy the Young Stars Game. No faceoffs. 31. Two words: More cheerleaders! 32. Two more words: No cheerleaders! 33. Play music during the action. 34. Every penalty, anywhere on the ice, results in a penalty shot. 35. Bring back the glowing puck. 37. After giving up a goal, you get to steal a player from the other team. 40. Like billiards, street basketball or Owen Nolan, if you don’t call your shot, it doesn’t count. 41. Play the game in Europe. Or a non-NHL North American city. 42. Secure sponsors to put up a financial bounty that’s big enough to impress even today’s multi-millionaires. Winning side takes all. 43. Forget trying to cut back on goals; go for broke. Eliminate goalies and make it like novice hockey where each skater takes a two-minute turn standing in the crease. 44. Maximize exposure by making the game a 15-minute contest during halftime at the Super Bowl. Invite Janet Jackson to preside over the ceremonial faceoff. But not Jastin Timberlake. Let’s keep the malfunctions to a minimum. 45. The Sean Avery Exemption: Each conference elects two agitators to liven up the game. The catch, though, is the shift disturbers actually represent the conference they don’t play in, so the guys who see them so often during the regular season – and have a good healthy hate on for them – get a chance to get in an all-star whack. 46. Scrap the Young Guns game; instead, make Kevin Lowe and Brian Burke team captains and have them select the remaining 28 GMs for a good, hate-filled game of 4-on-4. Just keep the shifts short. 48. Play it after the season is over. 49. Play it in the pre-season. Fans are hungry for hockey after three long summer months … and anything that spices up the exhibition schedule is welcome. 50. Play it like they did back in the day: an all-star team vs. the previous season’s Stanley Cup champion. 51. Bring back the goalie helmet cam. 52. Have a shootout – everybody shoots – before the game and spot the winning team a 1-0 lead. 54. Let’s see how talented these “all-stars” really are; intermission should be a talent show, where the players bust out the coolest moves they’ve got that are completely unrelated to hockey. Sure, they can blast slapshots 100 miles an hour, but can any of them juggle … skates? 55. Mandatory trash-talking. Who wouldn’t want to see Ilya Kovalchuk and Jarome Ignla fact-to-face, boxing weight-in style, at a pre-game press conference trading taunts and goal-scorers’ smirks?